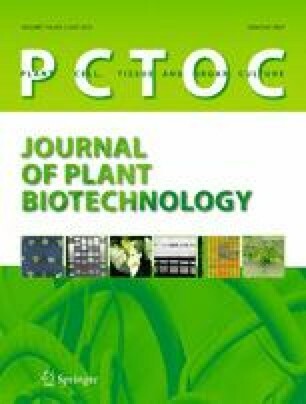 An efficient Agrobacterium-mediated genetic transformation method has been developed for the medicinal plant Podophyllum hexandrum Royle, an important source of the anticancer agent podophyllotoxin. Highly proliferating embryogenic cells were infected with Agrobacterium tumefaciens harbouring pCAMBIA 2301, which contains npt II and gusA as selection marker and reporter genes, respectively. The transformed somatic embryos and plantlets were selected on Murashige and Skoog (MS) basal medium containing kanamycin and germination medium, respectively. GUS histochemical analysis, polymerase chain reaction and Southern blot hybridisation confirmed that gusA was successfully integrated and expressed in the P. hexandrum genome. Compared with cefotaxime, 200 mg l−1 timentin completely arrested Agrobacterium growth and favoured somatic embryo development from embryogenic cells. Among the different Agrobacterium strains, acetosyringone concentrations and co-cultivation durations tested, embryogenic callus infected with A. tumefaciens EHA 105 and co-cultivated for 3 days on MS basal medium containing 100 μM acetosyringone proved to be optimal and produced a transformation efficiency of 29.64 % with respect to germinated GUS-positive plantlets. The Agrobacterium-mediated genetic transformation method developed in the present study facilitates the transference of desirable genes into P. hexandrum to improve the podophyllotoxin content and to enhance other useful traits. The authors are thankful to the Life Science Research Board, Defence Research and Development Organisation (DRDO), Govt. of India for financial support (DLS/81/48222/LSRB–171 BTB/2008) used to carry out the present work. The corresponding author is thankful to the University Grants Commission (UGC), Govt. of India, for providing an Emeritus fellowship under the BSR scheme. The authors are also thankful to Prof. S.K. Nandi, G.B. Pant Institute of Himalayan Environment and Development, Almora, Uttarakhand, India and Prof. M.C. Nautiyal, H.N.B. Garhwal University, Garhwal Srinagar, Uttarakhand, India, for help with the collection of Podophyllum hexandrum seeds. The authors are thankful to Dr. A.S. Rao for his valuable suggestions to improve the manuscript.